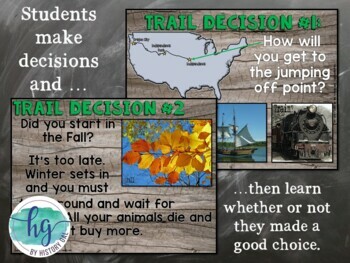 Oregon Trail: Will You Survive? 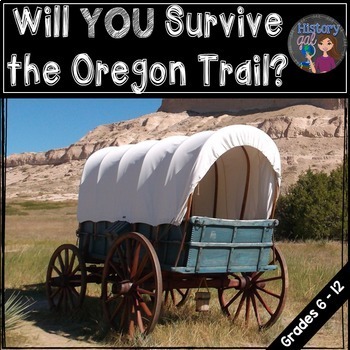 This fun Oregon Trail activity simulates the obstacles faced by pioneers traveling westward. 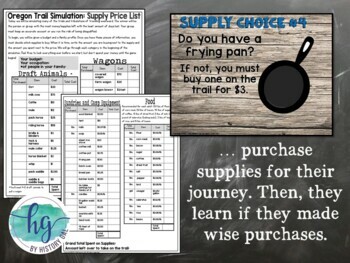 This student favorite is also a great cross-curricular activity as students have to buy supplies and manage their budget. And, it fits great into any westward expansion lesson. 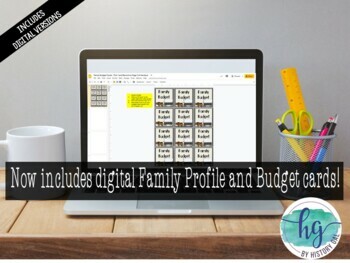 This download contains files that may be printed and copied or used in 1:1 or flipped classes. Use whichever version fit best with your class. The other version remain yours in case you ever need to use them (in case your school makes the jump to 1:1 classes sometime in the future or if you have a student whose IEP requires a hard copy of assignments instead of digital ones). You may put the materials in this file on a site for STUDENT USE that RESTRICTS access like Google Drive, Google Classroom, OneDrive, Edmodo, Blackboard, etc. where students are either invited via an email address or log in with a user name and password. IT MAY NOT BE UPLOADED TO A CLASS WEBSITE UNLESS THE SITE IS RESTRICTED TO STUDENTS WITH A LOGIN AND PASSWORD. Questions? Email me at andrea@musingsofahistorygal.com. Explorer Activity: Will You Survive a Trip Around the World? •	Please go to your My Purchases page (you may need to login). Beside each purchase you'll see a Provide Feedback button. Simply click it and you will be taken to a page where you can give a quick rating and leave a short comment for the product. Each time you give feedback, TPT gives you feedback credits that you use to lower the cost of your future purchases. •	Click on the Pin it button and pin it to one of your boards!